about The paint Estimator Program. When I say I tried to make this program as easy as possible, what I did was attempt to take as much guessing out of the estimate process as possible. Other then spending 20-30 minutes on setting up your company info, overhead and adding your employees from when you first install this program. You will find that it does not take much time at all to generate prices and nice looking proposals. 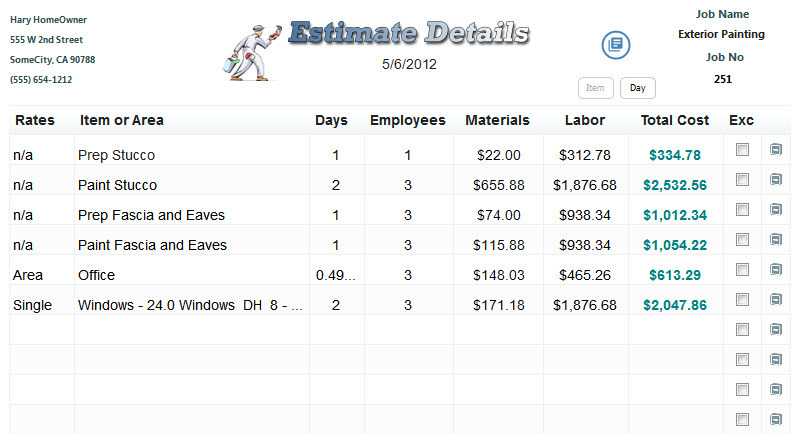 Also I tried to include a few other methods of estimating other then by the standard sqft method. 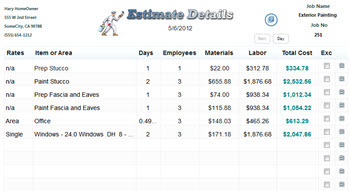 The 3 main methods this program uses is by the Item, by the Day and Production Rates. Let’s face it - estimating is just that, guessing how long it will take for you to perform specific tasks. It seems that just about every other paint estimating software out there only uses one method to estimate jobs and that’s by the square feet, linear feet or quantity. In other words “Historical Production Rates”. If you have a great history then nothing can really beat this method as this is probably the most accurate way of estimating. The issue though is not everyone has the data to go by. You could be just starting your business or you just never estimated that way. You could be the type that can look at a room and say to yourself "I can do that in 4 hours." I have discussed this topic with painters in the paint store and online and quite a few say they estimate this way. Some say that you are guessing but I would have to disagree. You are coming up with those hours based off of prior history. You might have painted a room like that a few months ago and remembered it only took you 4 hours. Prep eaves – they are in pretty good shape, maybe 4 hours for one guy to go around and look for loose paint. Prep stucco – Not much going on here, maybe allow 4 hours for one guy to check for cracks and stuff. Prep siding – Not allot of siding so let’s allow one day for one guy to give it a good sanding caulking and some spot priming. Next part would be to figure out the painting part, applying the finish coats to the above items. I think you get the idea by now. I think this is one of the most common ways that painters estimate other than using production rates. It’s fairly simple to do and works really well on exteriors. Here is a screen shot of the program dealing with the item method. Double click on the image to see a larger view. As you can see the way this works. In the days column you would enter the time allowed for this item. one day equals "8" hours. A half a day would be ".5" and so on. In the No Emp column is where you would put the number of guys assigned to this task. The exclusion box is a neat little feature where you can remove an item encase the customer does not want you to do it, or asks you "How much if you skipped the windows?" that sort of thing. N/A in the rates box means this was a direct input from the user. The "Area" means this line item was added using the area rates form. This form you can have multiple line items all compressed into one line for the grid you are seeing. The "Single" means this line was added using the single rates form. A quick way to add one of your production rates you might have as a single item.